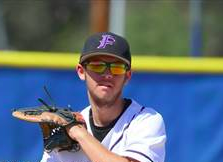 BARONA INDIAN RESERVATION (4-6-2019) – Foothills Christian junior Corbin Harris established a school record with nine RBI, powering the Knights past visiting Escondido Charter, 18-5, in Friday’s (Apr. 5) Pacific League opener for both ballclubs at historic Stars Field. Harris had the kind of day every player dreams about at the plate. Harris smacked a grand slam in the fifth inning. He also singled in the first, tripled in the fourth, and finally, doubled in the sixth to complete the cycle. “This win was great for all of us,” Harris said. We came together as a team today. Communicated and kept everyone hyped for the next play. Only six other ballplayers in CIF San Diego Section history have tallied for more in a single game, including the section and East County record-holder Jon Cox of Christian, who recorded 12 RBI against La Jolla Country Day in 1998. Among the other half-dozen includes Josh Barber, of Mountain Empire, who posted 10 RBI against West Shores (Salton City) on Apr. 24, 2008. Also collecting 9 RBI over the years are local players such as Jim Hinton (Christian, 1977), current umpire Jim Tatum (Santana, 1985), Jason Claros (Granite Hills, 1998), Travis Udvarhelyi (Patrick Henry, 1999) and two players from Ramona, James Meador (2006) and Zach Sherman (2015). After the White Tigers moved to within 6-5, the Knights answered with five runs in the 5th inning and seven more runs in the 6th to break open a close ballgame. Setting the table was Knights leadoff batter Jalani Brown. The center fielder batted 4-for-4 with a walk, scoring all five times. Harris also pitched 5.1 innings of relief to pick up the victory. For Foothills Christian (4-13 overall, 1-0 PL), Cameron Nicks contributed three hits, while Cade Cabral added two hits and a walk. Both scored three times. Max Merlan tacked on an RBI single in the second. The Knights are tied for first place with Tri-City Christian, which defeated Maranatha Christian in its Pacific opener. Escondido Charter (6-6-3, 0-2 PL) saw catcher Maxwell Kirton bat 2-for-3 with an RBI double, scoring twice.